Large-scale protests are underway everywhere in Brazil. Major peaceful demonstrations in Rio de Janeiro, São Paulo, Brasília, Belo Horizonte and many other capitals that will host World Cup games gathered over 240,000 people last Monday night, expressing people’s frustration over a range of issues, from the poor quality of public services to the lavish new stadia projects. The trigger incident was the announcement of a bus-fare increase of R$0,20 last week in São Paulo. Since then, anger at the constant rise in prices, poor public services, low standard of healthcare, corruption, inequality and lavish investment on international sporting events have brought predominantly young people mobilised by social networks onto the streets. Protestors question whether money spent on stadia construction could be used more profitably on health and education. The demonstrations intensified over the weekend during the Confederations Cup football tournament in the country, after harsh police crackdown, which responded with rubber bullets and tear gas. 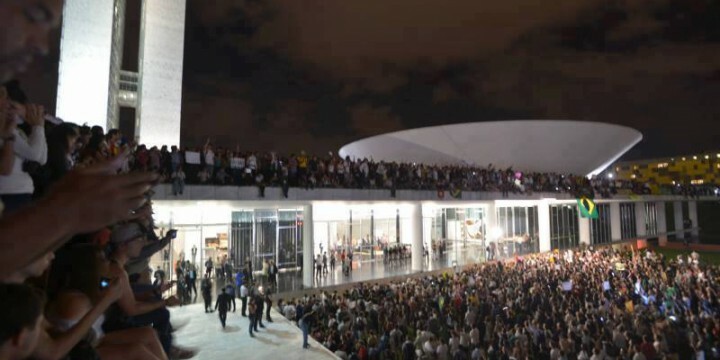 On Monday night, an estimated 5,000 protesters danced on the roof of Congress in Brasilia, the building designed by the modernist architect Oscar Niemeyer. 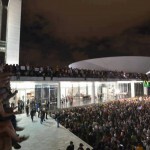 In Rio de Janeiro, an independent estimate put the number of protesters around 100,000, with only a small but much-commented number of them smashing building windows and setting fires outside the legislative assembly. In São Paulo, a crowd of around 65,000 marched peacefully. 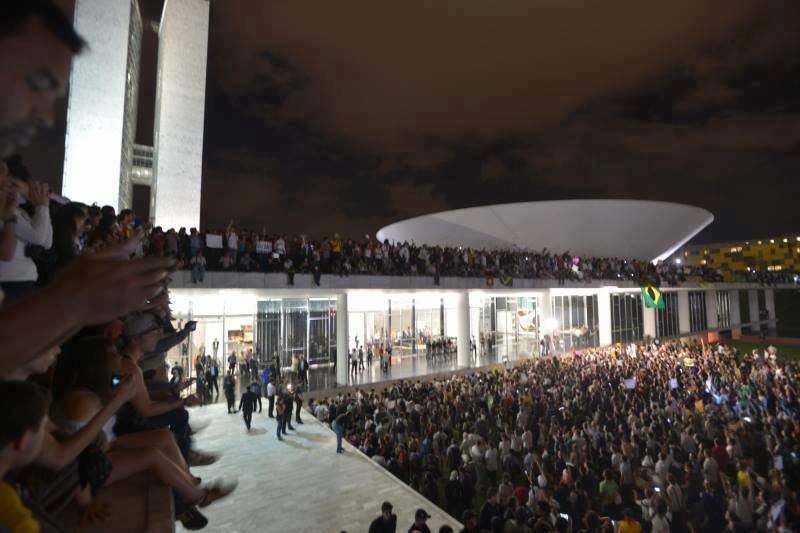 The rallies are some of the biggest ever seen in the country since Brazil’s military dictatorship ended in 1985. The right to non-violent demonstration has been vigorously defended in recent hours by the current President Dilma Rousseff and ex-presidents Fernando Henrique Cardoso and Luiz Inácio da Silva – Lula – have both taken to Facebook give their support to peaceful protest.